UPDATE : I made a pdf file with output readings of each PRE type using a 1Vpp source at input. A small and affordable mixer was always part of the electronic musicians setup. because they needed just a few channels, it had to be portable and relatively cheap. favourites for their sound in the electronic musician community. There are three vintage small mixers that are highly regarded for their specific sound. and others). It was a six channel stereo mixer with tone control on each channel. A compact and sturdy little workhorse. The second is also the product of the same company but a more modern one. since the early nineties and it is still used and loved for the sound. between musicians only this old first generation mixer has "that sound". sound. It was also used to mix some albums that became classics (like Biosphere Substrata). great idea to offer to the modular community the three classic sounds. identified which were the relevant aspects and made the prototypes. eurorack modules, each one replicating the audio qualities of the vintage classics. artists from the nineties on. 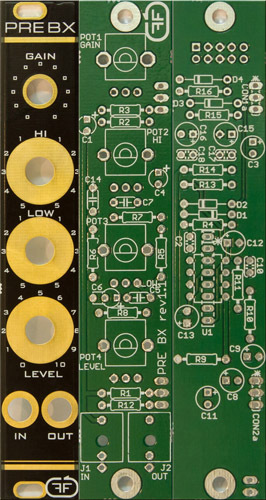 PRE CR - this modules emulates the sound of the high gain TB303 distortion. different sounds from bass to drums and noises. You will have some pleasant surprises. - all the modifications in the sound are made only with the PRE unit. - all the demos respect the formula : 2-3 measures original sound, increasing hi freq, increasing low freq, increasing gain, increasing hi freq etc. so these things can be used to get signals into the modular? do they still have a decent signal to noise ratio after raising a signal that much? are all 3 using the same circuitry for the eq portion, with only the preamp part itself being different between them, or is the eq section unique in each one also? They are not used only to get signals into modular, but also to shape sound from oscillators or any module you want, from soft clean sound, to extreme distortion with fat bass. Each module have different circuitry and different eq. PRE KM - You can obtain the sound of the 70's electronica, like Tangerine Dream leads and arps. Was looking at the schematic out of interest, but this inverts, right? First stage is inverting, second one isn't. Can you tack on extra inputs? ok nice, yeah i get that theyre mainly intended as tone modules and i think that's already cool and i might want to grab a few just for that purpose. i was just wondering how good they would be for bringing external inputs into modular. Yes. PRE BX and PRE KM inverts the signal, but an inverted saw or ramp will sound the same for ears. I preserved the original schematic, without adding extra parts to invert the signal again. Rising and falling saws can sound a bit different when run into a highly resonant filter. Worth checking. hey many thanks for sharing the schematics. i build in 5u so the panel combo is a bit ott, so may have a go at stripboarding it. Package with some mixer channels kit 2 arrived safely. Nicely packed, thanks! Which mixers are these modules emulating exactly? 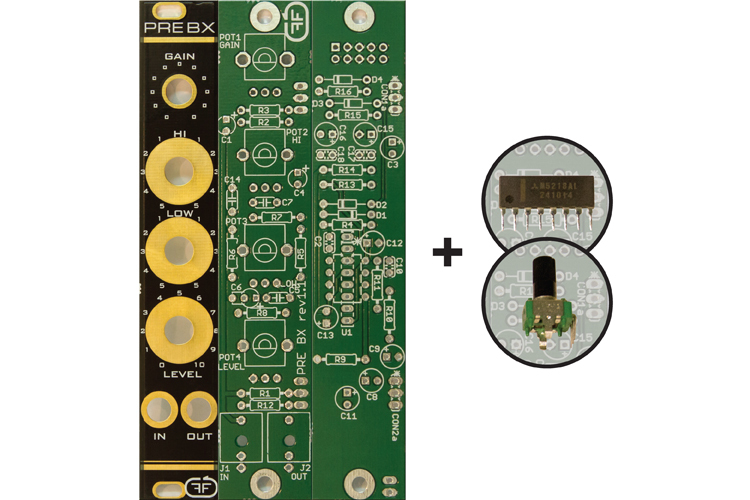 UPDATE : PRE BX is updated to rev 1.1 boards. On the bottom of the post you will find new building files, including the manual 1.1 and photo zip with details of the construction. - Added an additional 2pin molex connector for output on the back, for a future mixer summer, or to link the module to another module without a jack cable. - Added a filtering circuit for power, this doesn't affect in any way the circuit's sound, is just an extra protection for your power source. - Added an extra NP cap print on top of the 0.22u EL cap so you will not have to bend the pins of the 220N cap. - I enlarged the holes for the gain pot, so you will not have to drill them anymore. - I moved the 5p cap closer to the opamp terminals. I don't sell PCBs only. You buy the project, not only the pcbs. Consider the panels are a bonus, you are free not to use them, I will include them in the package anyway. Hey, do these have enough gain to amplify external audio to modular level? would also like to know this if anyone has any insight? Curious if anybody is using these, they look really cool. I was looking for some EQ modules that weren't gigantic and I always like something that can add a little character. Would love to hear other people's thoughts! I'm using this one and the Pre-CR. Both add some really good character to the sound, and also work as an input from external instruments. I'm using them as an input/overdrive for a TB-303 and it sounds great. Ah, that's very good to know. Thanks! I attached a pdf file in main post with output readings of each PRE type using a 1Vpp source at input. 1Vpp is lower than a laptop, phone or any sampler output. You can see in the pdf output Vpp at different gain, volume settings. I need second one of those and they are sold out. 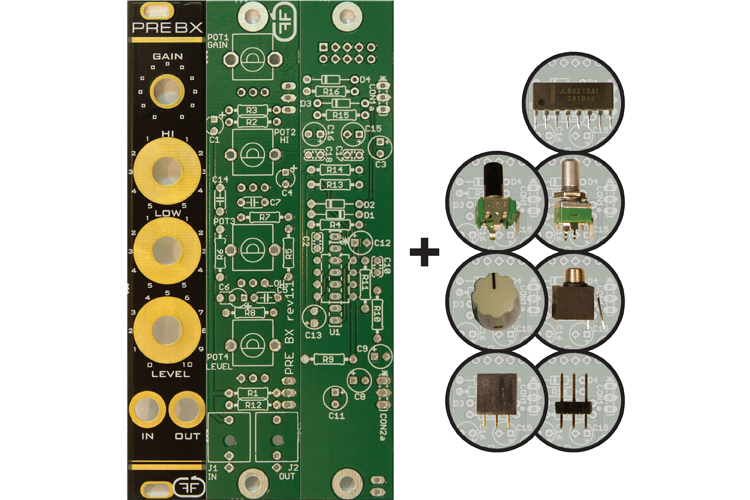 [UPDATE] PRE BX and PRE CR kits and modules are back in stock.